My previous PR/PB was not actually that fast: 45:41 from 2013’s Middlesex 10k in flat Victoria Park. And that was really only my second 10k, so I knew I could improve on that time. Training has been going well. I haven’t been running crazy mileage, but I have finally been getting to the track consistently for Tuesday and the occasional Thursday speed workouts. Also, my recent long runs have all been over 10k, which gave me some confidence for running the distance. I knew if I felt good I could pull off a PR/PB. Breaking 45:00 was my rough goal, with the more specific aim of 44:30. A 3-lap course meant that to break 45:00 I’d need to be under 15:00 for each lap. I also changed my race strategy. In the past year or two, I’ve been going out a bit conservatively in races, building over the course of the distance and finishing faster. 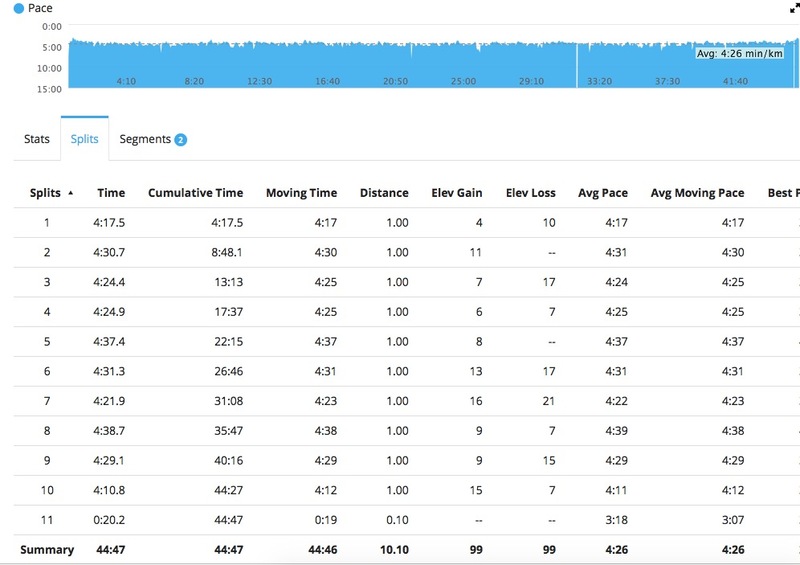 I think that was partly due to lack of confidence in my ability to hold a quick pace; the lack of confidence probably came from not doing as much speed work. But since getting my track legs back, I feel more confident at a faster pace, so I decided to go out pretty hard for this race and try to maintain it through to the end. Generally, the strategy worked. My first kilometer was a quick 4:17 to wake me up before settling into a just-maintainable pace of slightly under 4:30/km. Of course, each kilometer fluctuated a bit. I was slightly slower through 5km — 22:15 — than I’d hoped to be, but I still knew I could run a PR/PB with that. I went through the second lap in 30:00 so had to pick it up to finish under 45:00. My 5th and 8th kilometers were the slowest (4:37 and 4:39, respectively), but I dug in at 8km and gritted my teeth to 9km (4:29) before really pushing home in a 4:11 final kilometer. Man, that last kilometer felt long! An emerging side cramp didn’t help either; I hardly had any kick to the finish, but I did pass a guy just 10-15 meters before the line. Final chip time: 44:44 for a new 10k (6.2mi) PR/PB! (Average pace: 4:28/km or 7:13/mile). I came 12th lady out of 165 and 80th overall of 381 finishers, so not too shabby there. I’m pleased to have run under 45:00 and know that I can — or should be able to — further improve on the time I ran today. It felt good to run a PR/PB for the first time in over a year. The race was well-organized and had a nice, low-key atmosphere with a reasonable but not too late start time of 9:30am. Not to mention that Regent’s Park is just lovely to run through. There were a handful of other Heathsiders racing — well done, all! This entry was posted in celebrations/holidays, climate, community, exercise, health, Highlights, pictures, Race Recap, running and tagged 10k, bank holiday, bank holiday weekend, Easter, Garmin, London, London Heathside, race, Regent's Park, running on 05.04.2015 by taplatt.